Ever since there have been people, there have been explorers, looking in places where other hadn't been before. Not everyone does it, but we are part of a species where some members of the species do, to the benefit of us all. If that's how you wanna invoke your evidence for god, then god is an ever receding pocket of scientific ignorance, thats getting smaller, smaller and smaller as time goes moves on. When your reasons for believing something are justified ad hoc, you are left susceptible to further discoveries undermining the rationale for that belief. What are the lessons to be learned from this journey of the mind "through the universe"? That humans are emotionally fragile, perennially gullible, hopelessly ignorant masters of an insignificantly small speck in the cosmos. Have a nice day. One thing is for certain, the more profoundly baffled you have been in your life, the more open your mind becomes to new ideas. Chimpanzees are an evolutionary hair's-width from us.... Now imagine a species on Earth, or anywhere else, as smart compared with humans as humans are compared with chimpanzees. How much of the universe might they figure out? We can trace the elements. They were forged in the centers of high-mass stars that went unstable at the ends of their lives, they exploded, scattered their enriched contents across the galaxy, sprinkled into gas clouds that then collapsed and formed stars and planets and life. Science is something to be proud of, it allows us to understand the world inspite of ourselves. I am proud to be part of a species where a subset of its members willingly put their lives at risk to push the boundaries of our existence. I have found that when calculating what no one has calculated before, like my observing sessions on the mountain, my mental acuity peaks. Ironically, these are the times that I would flunk the reality check normally reserved for mental patients and dazed boxers: What is your name? What day is it? Who is the president of the United States?... I do not know, and I do not care. I am at peace with my equations as I connect to the cosmic engines that drive our universe. 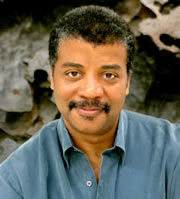 Neil deGrasse Tyson is an American astrophysicist and science popularizer. He is known for his appearances on various tv-shows and events.